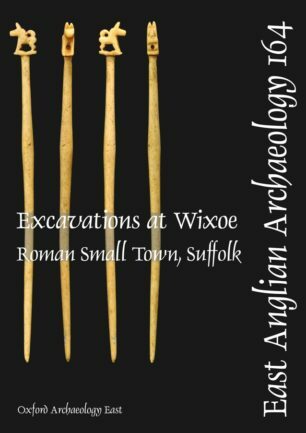 Roman Wixoe, one of eight potential small towns of the period in Suffolk, developed adjacent to an ancient ford across the River Stour and close to the intersection of two major Roman roads. 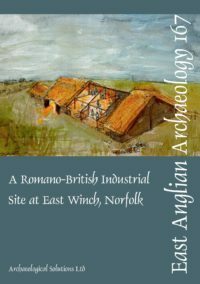 Until investigations were carried out in advance of the construction of the Abberton pipeline, as described in this volume, little archaeological work had been undertaken within the town. However, extensive fieldwalking and metal detecting surveys in the general area had generated over 4,000 Roman coins. Analysis of the combined data demonstrates that Wixoe was a Flavian foundation, established some years after the Boudican revolt. It seems to have reached its peak in the 2nd century, followed by a slow decline until its eventual abandonment in the early 5th century. Significant new evidence reveals the layout and development of the settlement, its buildings, burials, zones of activity and settlement boundaries. A major contribution of this work has been the reinterpretation of the town’s road network, which challenges the existing model for the extensive road complex that linked the major settlements across the border of the modern counties of Suffolk and Essex. A consideration of the town’s hinterland and sphere of influence includes some of the contemporary farmsteads revealed by the pipeline to the north of Wixoe. Taken as a whole, the excavations produced significant finds assemblages that include a major collection of pottery, analysis of which has identified supply patterns similar to other civilian Roman settlements in the region, notably Great Chesterford. Overall, the results make an important contribution to the continuing debate over what constitutes a Roman ‘small town’.